Interview with Rosilah Hasan who is currently working at BASF. With 20 years of accounting experience, Rosilah chose to return to a role that she is most familiar with but decided to opt for a multinational corporation for a change. 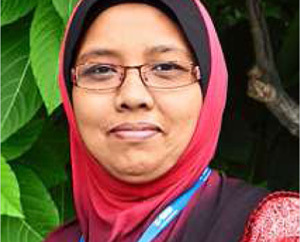 Rosilah began her journey with BASF Asia-Pacific Service Centre Sdn Bhd in 2014 as an Accounts Payable Analyst on a job sharing (part-time) basis. Rosilah decided to take some time off after being with her previous company for three years. Her decision to stay out of the workforce was to spend more time with her family and to take care of her ailing mother at that point in time. During her time off, she focused on caring for her children and mother hence did not consider returning to her career immediately. However, she did explore a few options of working from home but she later realized that she is more suited for an office job. Rosilah decided that it was time to return to the workforce after her mother’s recovery. The first step she took in her job search was registering her profile on job search portals. However, it was not an easy task. Getting a job that offers flexibility to cater to her needs of caring for both her children and mother from time to time was challenging. To top it off, she was not mobile hence making it almost impossible for her to accept any role located outside KL. One day, through a friend, she came to know about flexWorkLife.my where BASF’s job sharing (part-time) role was advertised, which she then applied. While acknowledging that it would not be easy for her to transition back to the workforce, Rosilah was however excited and grateful when she was offered a job with BASF. Prior to returning to the workforce, Rosilah made arrangements for her mother and children to ensure that they were well taken care of. At this point of her life, she felt that the time was ripe for her to return to the workforce seeing that her youngest child was also at a stage where she was already more independent. Today, Rosilah is thankful for the learning opportunity given to her at BASF. Reassured by the fact that she is only required to work four hours a day, she finds herself more focused with her part-time work arrangement as her attention is not divided between her work and family commitments. Hence, she is adapting well to BASF’s work culture and looking forward to contributing even more to the company. With a greater work-life balance, she finds herself able to perform her work more efficiently and effectively. Very frequently family priorities cause women to sacrifice their career. Hence, women initiatives carried out by organisations such as BASF are highly relevant to women. Her advice to women is not to give up when looking for a suitable flexible role even if they are harder to come by these days. She believes in being persistent in job search. Lastly, she also wishes that more Corporates in Malaysia would provide more flexibility to encourage women to return to the workforce and to provide continuous support to women once they have returned.